For the first time, ocean data from Northeast Greenland reveals the long-term impact of the melting of the Greenland ice sheet. The observed increase in freshwater content will affect the conditions in all Greenland fjords and may ultimately affect the global ocean currents that keep Europe warm. Today, researchers from Aarhus University in Denmark present a 13-year long time series of data in the journal Nature, Scientific Reports, which shows how the melting ice affects coastal waters in Northeast Greenland. Over the years, the dramatic meltdown of ice in the Arctic Ocean has received great attention and is easy to observe via satellite images. 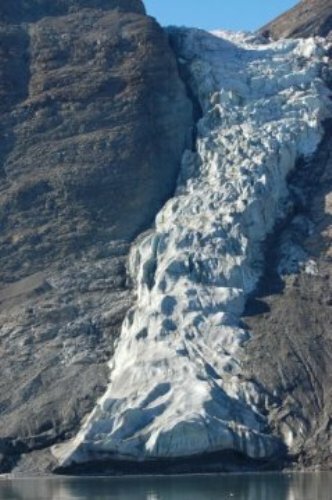 Also, glaciers have been observed to melt and retreat and the researchers know that today’s meltdown of the Greenland ice sheet has more than doubled compared with the period 1983-2003. How the increased influx of fresh water will affect the marine environment is, however, largely unknown. Now, unique annual measurements made within the framework of the ‘Greenland Ecosystem Monitoring Program’ since 2003 in Northeast Greenland tell a clear tale — fresh water from the ice sheet accumulates in the surface layers of the surrounding sea and flows into the Greenland fjords. The measurements were made in Young Sound and in the sea outside Young Sound. Here, the long time series shows that the surface water layers became up to 1.5 per mill less saline during the measurement period. The is equivalent to an increase in freshwate content from approximately 1 m in 2003 to almost 4 m in 2015! Part of the fresh water likely originates from melting of the Greenland Ice Sheet north of the Young Sound and is transported with the East Greenland ocean current along the eastern coast of Greenland. From the ocean, the fresh water flows into the Greenland fjords where is influence local circulation with impacts on the production and ecosystem structure. More fresh water in the surface water layers makes it harder for the nutrient-rich bottom water to rise to the upper layers where the sunlight ensures the production of plankton algae in summer. Plankton algae form the basis for all life in the sea and a lower production of algae will result in a lower production of fish. Today, fishing constitutes approx. 88% of Greenland’s exports. Melting of the ice sheet in Northeast Greenland is significantly lower than in southern and western Greenland, and the researchers warn that the effects may be far more dramatic in other parts of the Greenland coastal waters than in Young Sound. At a global scale, the increased melting of the ice sheet contributes to rising sea level and may impact global ocean circulation patterns through the so-called ‘thermohaline circulation’ that sustains among others, the Gulf Stream, which keeps Europe warm.